An important principle in linguistics is that words show no predictable relation between their form and their meaning (arbitrariness). Yet this principle does not have exclusive reign. Some words have forms that suggest aspects of their meaning (iconicity). Some groups of words have subtle statistical properties that give away something about their grammatical function (systematicity). To fully explain how words work, we need to recognise that the principle of arbitrariness is not the whole story, and that words can additionally show degrees of iconicity and systematicity. Often, arbitrariness is thought to be not just necessary but also sufficient to explain how words work. We show this is not the case: non-arbitrary patterns in language are more common than assumed, and they have implications for how we learn, process and use language. Often, arbitrariness and iconicity are pitted against each other. We show this is an oversimplification: iconic words have a degree of arbitrariness and the two do not exclude each other. Often, the role of iconicity in language is thought to be minimal. We show that it can differ dramatically across languages and also varies as a function of meaning and modality (e.g. signed or spoken). Sometimes, iconicity and systematicity have been confused. We show that distinguishing them helps us to better understand vocabulary structure, by showing why we may expect iconicity to show certain universal patterns while systematicity allows more language-specific patterns. Sometimes, we may forget that words are not abstract ideas but tools that have their own history. We argue that the way words are learned and used influences their form, and that this may help explain how arbitrariness, iconicity and systematicity pattern the way they do. Sometimes, language scientists make far-reaching claims based on studying a small portion of the vocabulary, or a small number of (typically Western) languages. We argue that we can get a better picture of language by looking at a wider range of evidence. Dingemanse, Mark, Damián E. Blasi, Gary Lupyan, Morten H. Christiansen, and Padraic Monaghan. 2015. 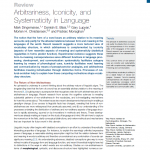 “Arbitrariness, Iconicity and Systematicity in Language.” Trends in Cognitive Sciences 19 (10): 603–15. doi:10.1016/j.tics.2015.07.013. This entry was posted in Ideophones, Linguistics and tagged arbitrariness, iconicity by mark. Bookmark the permalink.